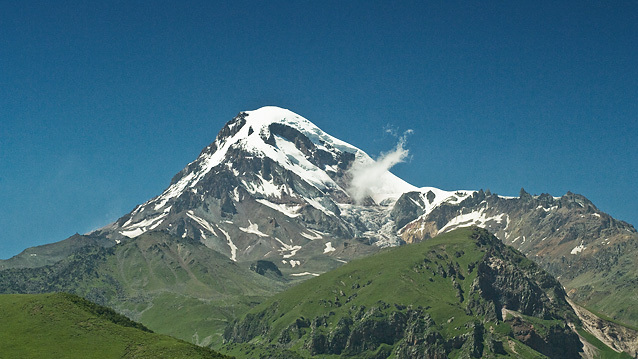 Skie's not the limit when trekking in Caucasus. Mount Khazbeg is 5047m over sea level at the summit. Polish trekkers preparing for Mount Khazbeg. be a challenge. First of all there are the countless rivers you have to cross. They tend to involve jumping from one unstable stone to an other, or balancing on a slippery piece of wood. The rivers are always very fast and furious. Second, it is the weather: When you start off it might be a pleasant 30 degrees and sun, but when the more or less regular afternoon thonderstorms with extreme rain are unleashed it gets freezing cold. Expect a temperaturedrop of 20-25 degrees. I have spent the coldest night ever in my life absolutely soaking wet in a worn down hide out up in one of the mountain passes. It's no problem if you are prepared for it. But if you are not, you will be in trouble. The small rivers suddenly become raging masses of water impossible to cross. and the track frequently falls into the river. Also remember to protect your self against the sun. It's burning skin faster at high altitudes. That aside, you can experience some breathtaking moments which will stay in you memory the rest of your life. Trekking can be very social. Contrary to what you might think, trekking is a great way of meeting other people. 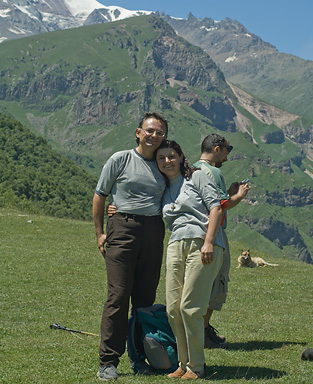 Along the routes you can meet people from a multitude of nationalities, trekking like you. In Kasbegi we met the Bulgarian couple Nevena and Marko. Somebody had stolen their camera in Tbilisi, and they had no pictures from their summer trip to Georgia. I took a couple of pictures of them, and we had a nice e-mail conversation afterwards. In the middle of this the Polish trekker Slavomir came by, and joined us on his way to the glacier near the summit of mount Kazbegi. We also exchanged pictures on e-mail afterwards. 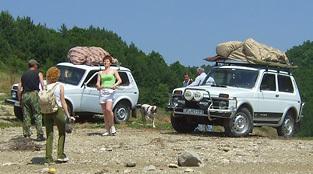 Trekking often involves a Niva. To get to a destination in the mountains that are suitable for trekking, you often need som serious transport. The Lada Niva is the absolutely best choice. This car has really impressed me. In Norway I drive a Jeep Wrangler 4WD, and I have also driven Land Rover for some years, but the Lada Niva is by far a much better vehicle for extreme tracks, and believe me: Most of the roads in the mountain areas don't look like roads. They are more like dried out rivers. In Georgia it is possible to hire a Niva for 70 dollar a day. Where to go, with who? Most popular regions are Khasbegi, Racha, Tusheti, and Lagodechi. It is definitely a smart choice to hire a guide for the trip. The mountains are in some cases dangerous. 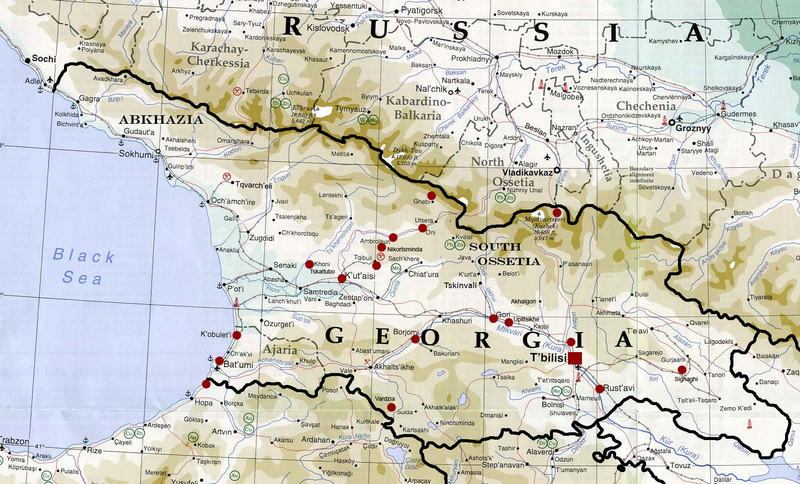 If you don't spek Georgian, a guide is obligatory. They know the area and the people, and can arrange horses,and show you the best spots to fish. 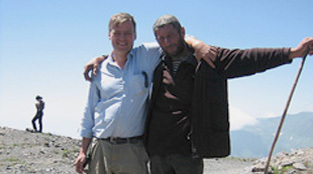 A friend of mine, Hans Heiner Buhr, an artist from Berlin now living in Tblisi, is one of the best trekkers you can hire. He speaks English, German, and Russian fluently. He is the one on the left in the picture with his friend Elgudja in the Albano Pass. It's social! Meeting Nevena and Marko from Bulgaria. You usually need to hire a Niva to get anywhere.